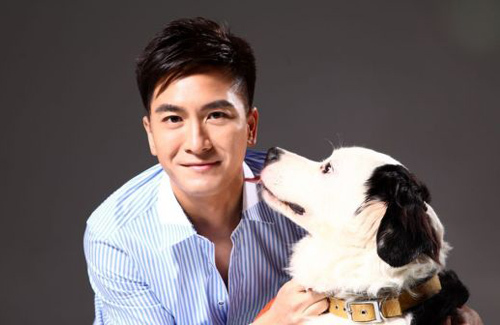 Why is Kenneth Ma Not Dating Natalie Tong, Rebecca Zhu, or Eliza Sam? Above: Kenneth Ma in a photo shoot for his new skincare ad. Last year’s The Hippocratic Crush <On Call 36小時> sent Kenneth Ma’s (馬國明) popularity skyrocketing with his role as Dr. Cheung Yat Kin, in which the audience loved. He not only received the 2012 TVB My Favourite Male Character award, but also the Astro On Demand Best Actor award in Malaysia. Anticipated sequels to be released this year include Triumph in the Skies 2 <衝上雲霄II> and The Hippocratic Crush 2 <On Call 36小時II>, which will both feature Kenneth. Near the end of the year, he will also be filming for a golden deluxe drama by Wong Jing (王晶). Kenneth revealed that his goal in 2013 is to earn enough money to purchase a 1,300 square feet flat in the eastern district of Hong Kong Island. He would like to live with his parents so that he can take care of them. At 39 years old, Kenneth is still young at heart and loves to spend time with his family. As long as he has money to earn, Kenneth does not mind the tabloids’ rumors. “I know if there are no rumors, there won’t be a talking point. But I must be rumored with someone who is single, or else it will look bad! The physiognomist told me that instead of gaining pursuers, I will be involved in gossip this year!” Kenneth decided that his plan will be to talk less and work more. 28 comments to Why is Kenneth Ma Not Dating Natalie Tong, Rebecca Zhu, or Eliza Sam? Kenneth has flawless skin in that picture…maybe with a touch of photoshop. I cannot wait to watch OC2!! too much light..even the white dog is almost invisible. Kenneth sounds like a very humble and down-to-earth guy who have very deep thoughts (and maybe think too much as well). I’d like to spend a day with him. Kenneth can make the ladies laugh if he chooses to with his witty humor. However, his comments on dating reveals his lack of proactive measures to find a girlfriend. He may be best classified as the “couch potato” guy waiting for the woman to chase after him. Not a night …….. just joking! I think maybe he think these girls are not pretty enough for him ,am I right? Wow, that conclusion seems very sudden and out of nowhere, not that I’m trying to be offensive but since you asked…First off, Natalie Tong is a model and also in my opinion she is very pretty. Then we have Eliza Sam who is currently and constantly being called “goddess” by many. Plus, Kenneth said so himself that Eliza is cute and being cute is usually enough to attract someone. And Rebecca Zhu was a Miss Hong Kong 2011…Kenneth also said himself that “All the girls within the industry are beautiful” and since all 3 girls are in the industry I think it’s enough evidence to say that your conclusion is incorrect? Again, I’m just answering your question. I think maybe those girls do not like Kenneth Ma. You do know that the picture above has been photoshopped right? His skin was pretty bad in Season of Love even with all the make-up, but probably better now with the skincare ad. Kennth is a simple guy who does not like to get involved in triangle love relationships. Happy for him! There are many fishes in the ocean, Charmaine, Kate, Myolie etc. Aren’t they currently single? ‘Kenneth further revealed that girls outside the industry show no interest in him’. This isn’t correct! Bet there’s heaps of fan girls who would die to be his girlfriend lol he just hasn’t found the right girl outside the industry yet. Also i don’t get what was so good about his character in The Hippocratic Crush. I personally thought it was mediocre and kind of boring. I liked his character in Three Kingdoms RPG and Tiger Cubs much better. He’s so good in comedy and badass roles. it sounds weird to have kenneth win the best actor award before LF, ron and bosco. but satisfied he’s finally getting recognized! yea…it would be a interesting…but look like TVB has no other chose for Best Actor…Bosco, Raymond are focus on China market this year…Ron??? have to see how he act in Triumph in the Skies 2 , but Kenneth has two drama, both Triumph in the Skies 2 and On CAll 2….well, I am not fans of any of them…but all of them work hard…and deserve them chance from TVB! I doubt Kenneth would get best actor this year. He’s not the lead in triumph in the skies 2 and his reprisal as Dr Cheung would have lesser scenes to accomodate Lawrence and the other new characters in on call. maybe next time Kenneth! amoung those three girls, i love Natalie Tong (唐詩詠) the most…hope she can find a good man…and look like Ken is a good man…hope they can go in real!!!! I hope he is dating someone in secret! Guys like this who never ask girls out will remain single for a long time. it sounds like kenneth will just settle for a girl… probably not someone that he is deeply in love with since when asked about his ideal significant other, he doesn’t ask for too much. Okay, gotta make connections with Kenneth’s mom so she can introduce me to him.